Oh, this is so cool. 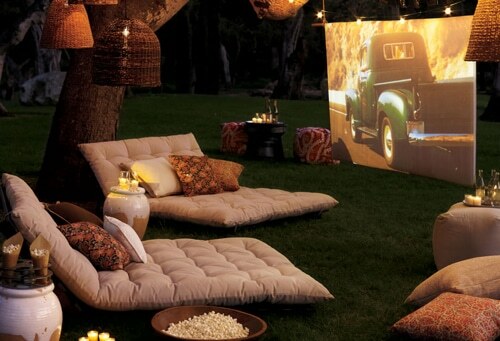 Imagine, lounging in the comfort of your backyard on a warm summer evening. Snacks, drinks, popcorn and your favorite movie projected on a screen just in front of you. There’s no limit to the ideas for backyard comfort; cushy chairs, lounges, sofas, tables, candles…have fun with it! If you’ve got some queen size sheets, and a few other supplies, you have ll you need to get started hosting movie night at your house!